Are our public schools failing due to neglect and corruption or are they failing because their design is fundamentally flawed and damaging? This is the question at the center of Nikhil Goyal's Schools on Trial. 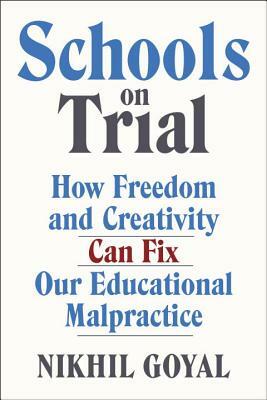 Through detailed and exhaustive research, he explores the history of America's public schooling and it's shortcomings at the conceptual level. There is a lot of negativity in the beginning (i.e. if schools are set up the same as prisons, how can we hold children responsible for resorting to a prison mentality? ), but the bulk of the book is hopeful. Goyal cites example after example of schools that are educating students in new and innovative ways, using technology and the very community they inhabit to build something more lasting and tangible than test scores. The fact that Goyal is so young allows him to write about these things with a sense of urgency most of us have already lost. I wouldn't say this is a thorough blueprint of how we can fundamentally change our education system, but instead a call to arms. It hopes to get us mad enough and informed enough to start making the changes necessary to save an education system increasingly in shambles.